For many the world over, Nabisco Oreo cookies are the number one snack of all time. Whether they're being pulled apart to get to the creamy inside filling, dipped in milk at the late-night kitchen table or just eaten one tasty bite at a time, Oreo cookies are known and loved everywhere. Crumbled chocolate Oreo cookies also make a great cake base, and we've got 25 lb bags of crunch pieces in small, medium and large chunks for cakes and other baking needs. Nabisco Oreo Medium Crunch Pieces - 25 Lb. Nabisco Oreo Resealable Medium Crunch With Filling Pieces - 2.5 Lb. Nabisco Mini Oreo Multi Pack Cookie - 12 Oz. Nabisco Oreo Cream Cookie - 5.25 Oz. Nabisco Oreo Mini Chocolate Sandwich Snack Stak - 8 Oz. Nabisco Golden Oreo Pepper Convenience Pack - 5.5 Oz. Nabisco Oreo Miniature Cookie Single Serve - 1.5 Oz. Nabisco Oreo Cookies 100 Calorie Pack - 0.81 Oz. Oreo Medium Crunch Large Pieces - 25 Lb. Nabisco Oreo Small Topping Pieces - 1 Lb. Brownie Oreo Creme Filled Individually Wrapped - 3 Oz. Cookie Oreo Chocolate Cream - 15.25 Oz. Cookie Oreo Golden Double Stuff - 15.25 Oz. Oreo Cookie Double Stuff - 15.35 Oz. Oreo Double Stuff Convenience Pack Chocolate - 5.6 Oz. Nabisco Oreo Sandwich Cookies Chocolate Mint - 15.25 Oz. Nabisco Oreo Sandwich Cookies Chocolate Peanut Butter- 15.25 Oz. Oreo Go Paks Mini Chocolate Sandwich Cookies - 3.5 Oz. Nabisco Oreo Cookies - 1.02 Oz. Oreo Cookies-Sleeve Pack - 1.59 Oz. Oreo Cookies-Sleeve Pack - 2.4 Oz. Nabisco Oreo Cookies-Single Serve Chocolate - 2.4 Oz. Nabisco Oreo Cookies Golden - 14.3 Oz. Nabisco Oreo Cookies Birthday Cake - 15.25 Oz. Milka Chocolate Bar Oreo - 2.88 Oz. Milka Chocolate Bar Oreo - 1.44 Oz. Milka Chocolate Bar Oreo - 3.52 Oz. Milka Chocolate Bar Oreo - 10.5 Oz. 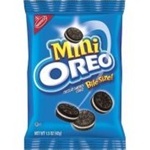 Nabisco Oreo Cookies Mini - 3 Oz. Oreo Cookies King Size - 4 Oz. Oreo Double Stuf Cookies Golden Oreo - 4 Oz. Oreo Cookies Double Stuff - 4.1 Oz. Buying Oreo wholesale cookies saves you money, and we've got sleeves of Oreo snacks (2.4 oz) packed 120/case and 1.59 oz sleeves of Oreo chocolate sandwich cookies, 120 units per case. Oreo wholesale wafer cookies (without cream) come in 18.16 lb or 23 lb boxes. These bulk Oreo cookies are great for garnishing ice cream desserts. Wholesale Oreo Cookies keep the kids happy and smiling. We stock every different type of oreo cookie made for your foodservice customers. In a recent survey, people were asked if they could only take one thing with them to the moon, what would it be? Oreos was #1.